Are you setting your alarm for three o’clock Friday morning? That’s what DVR is for. I admit, I am kind of caught up in the royal wedding frenzy. Who doesn’t love a wedding? Actually… my brother. He hates weddings. But that’s because he is a party pooper who doesn’t like to dance and he isn’t a fan of cake (scary, I know). Which is why my Mom and I are not inviting him to our Wedding High Tea. Yep, we’re going to hang out in front of the television, watch our recording of William and Kate, and eat scones. You should too. Eat scones, I mean. I might be tempted to go all out for Wedding High Tea… scones with clotted cream, tiny tea sandwiches filled with cucumber, salmon and watercress, little lemon tarts and chocolate truffles. But I’ll probably just make these apricot walnut sour cream scones because with apricots and walnuts, who needs more? They may be more New England than Ye Olde England, but they are certainly tasty. I love the softness of sour cream scones. The texture is luxurious, and the recipe is forgiving. These scones are fantastic with a good cup of tea, which is convenient since tea is, of course, the whole point here. I’m a huge fan of Harney & Sons loose leaf teas. I just discovered their Paris tea, which truly does taste like the teas houses of Paris. Years ago, I spent many lazy afternoons in a tiny Parisian teahouse near Rue Mouffetard writing letters, real letters, on real paper. When was the last time you wrote a letter? This fruity black tea makes me want to write letters. 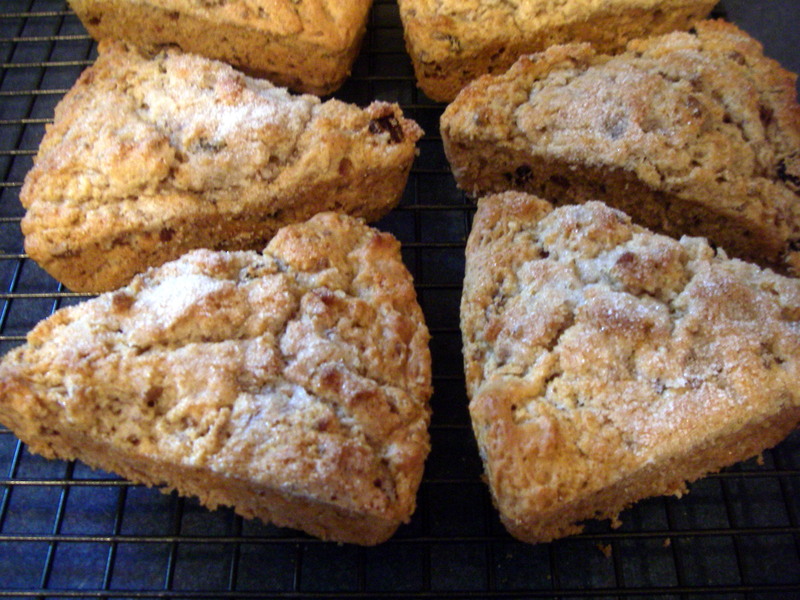 And it will be wonderful with my apricot walnut sour cream scones. What is your favorite tea? Any other recommendations for what to drink at our Wedding High Tea? Preheat the oven to 400 degrees. Mix together the flour, sugar, baking powder, baking soda and salt in a large bowl. Cut the butter in small pieces and add to the flour mixture. Rub the butter into the flour mixture with your fingers until no butter pieces are larger than a pea. Stir in the sour cream, vanilla, apricots, and walnuts. Using your hands, form the wet, ragged dough into a ball. On a floured surface, knead the dough about a dozen turns and then flatten the ball into a disk and cut into eight wedges. Place the wedges on a greased baking dish (or use a fancy-dancy scone pan like I did). In a small bowl, combine the cinnamon, flour and brown sugar. Cut the butter in small bits and rub in with your fingers. 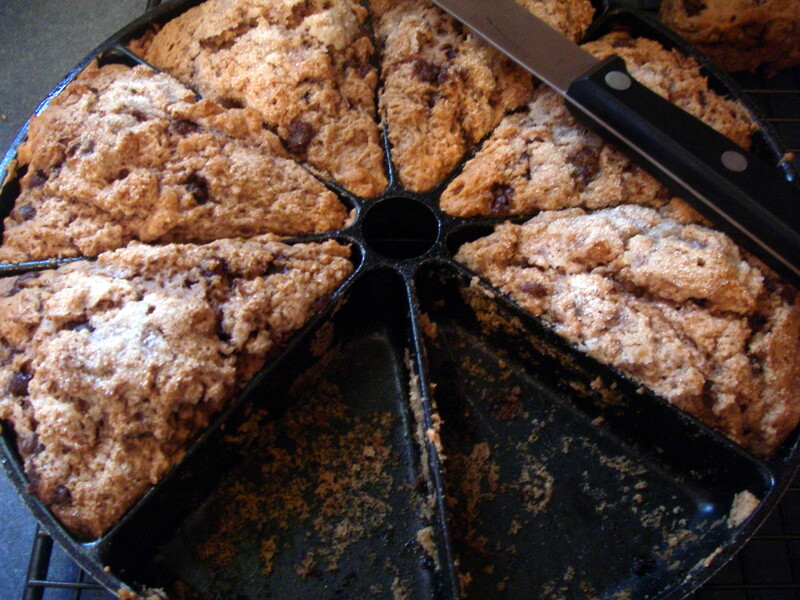 Sprinkle the crumble topping over the scones, pressing in a bit to make sure it sticks. Bake until golden, about 25 minutes. Serve warm with butter and jam. I wanted to share my grandmother’s Passover brisket recipe with all of you. But no matter how many times I fiddle with the proportions, or adjust the oven temperature, it still doesn’t taste like Nannie’s. While I’ve happily tweaked some of Nannie’s recipes, including her Hanukkah Latkes and her Chocolate Zucchini Loaf, the brisket is sacred. I have a few more tricks to try, and as soon as I get it right I promise to share. But in the meantime, a breakfast treat. Rich and saucy brisket may be the iconic Passover seder dish, but after two nights of brisket, potato kugel, charoset and macaroons, even deliciously iconic gets old. And matzo for breakfast for eight days? No, thank you. 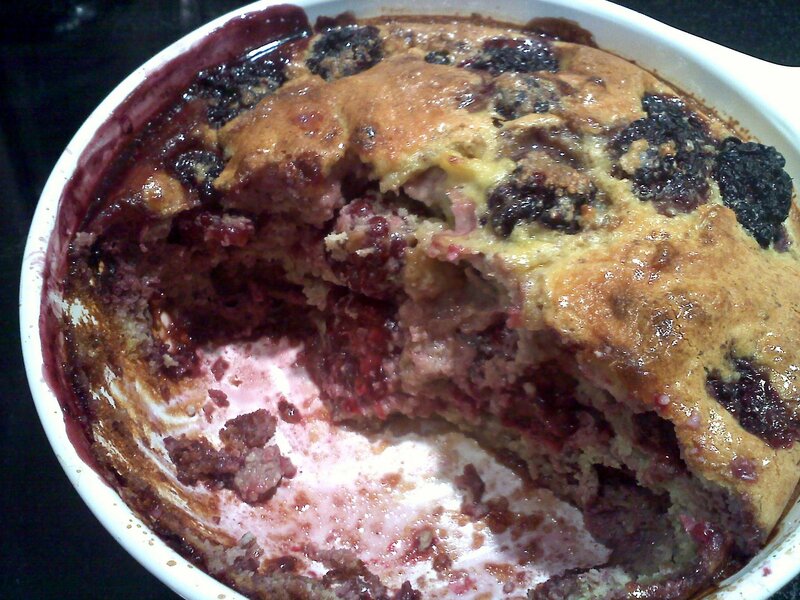 This sweet and hearty clafoutis breaks up the days in which oatmeal, toast and cereal are off limits. 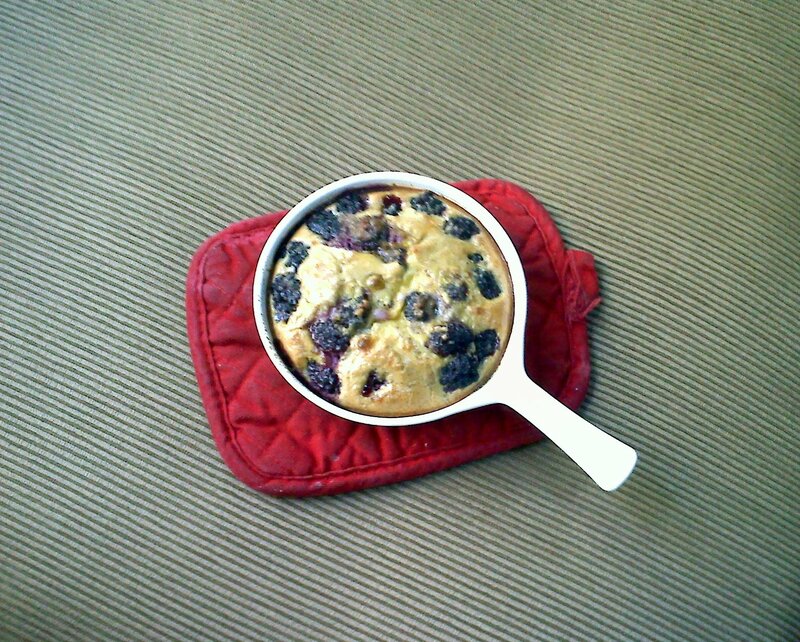 A typical French clafoutis is a light, fruity and eggy dessert, but anytime I can swing dessert for breakfast, I go for it. And why not? Eggs, berries, almonds… sounds like breakfast to me. You could serve this for dessert, if you like, with a bit of gently whipped cream. But at breakfast, a dollop of Greek yogurt does the trick. 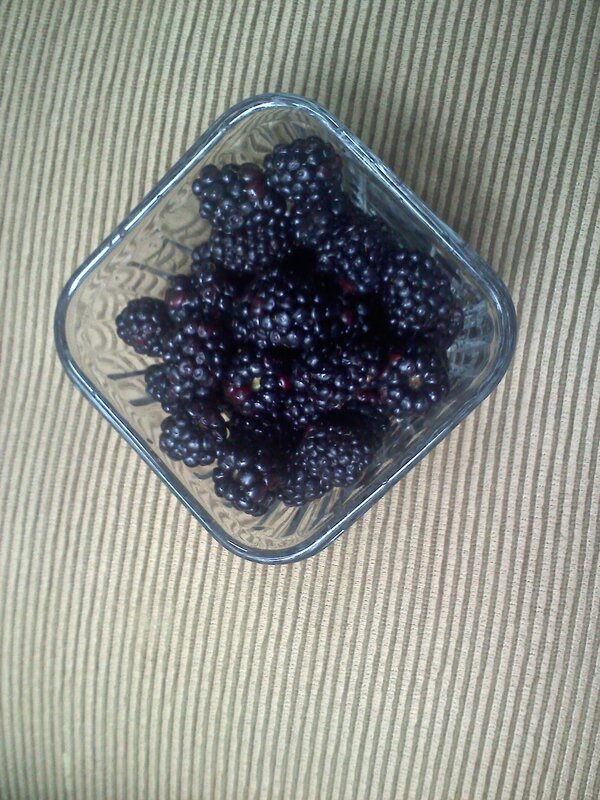 I love the big, juicy blackberries here. But feel free to change it up with other fruits, or even a mixture of fruits. Early spring strawberries would be lovely. Preheat the oven to 400 degrees. Coat a small baking dish with cooking spray. Beat the eggs until frothy. Beat in the cream, almond meal, and cinnamon. Pour the mixture over the berries and sprinkle with the sugar. Bake until puffed, brown, and set in the center, about 35 minutes. Serve warm, with Greek yogurt if desired. A note on the baking dish: you can double the recipe and bake in a 9-inch square pan, if you prefer. To prepare the recipe for just two servings, feel free to use whatever small oven-safe dish you have on hand. This is a very forgiving recipe! But the larger the dish, the more the batter will spread out, and the less cooking time you will need. So keep an eye on the clafoutis as it bakes. Moving is a slow and steady process. Actually, that’s not true. It’s more like hurry up and wait. But the pots and pans are still safely tucked away in their boxes and the cookbooks are stored in my parents basement. Needless to say, I haven’t been doing a whole lot of thrilling cooking. We did, however, make a purchase. And I’m dreaming of the pies that will come from this quirky oven and the bacon I will fry on the range. The gas stove and oven sit next to a wood burning stove that will keep our kitchen cozy and warm. My mother thinks I’m crazy for loving an appliance made before my grandfather went bald, but it suits me. 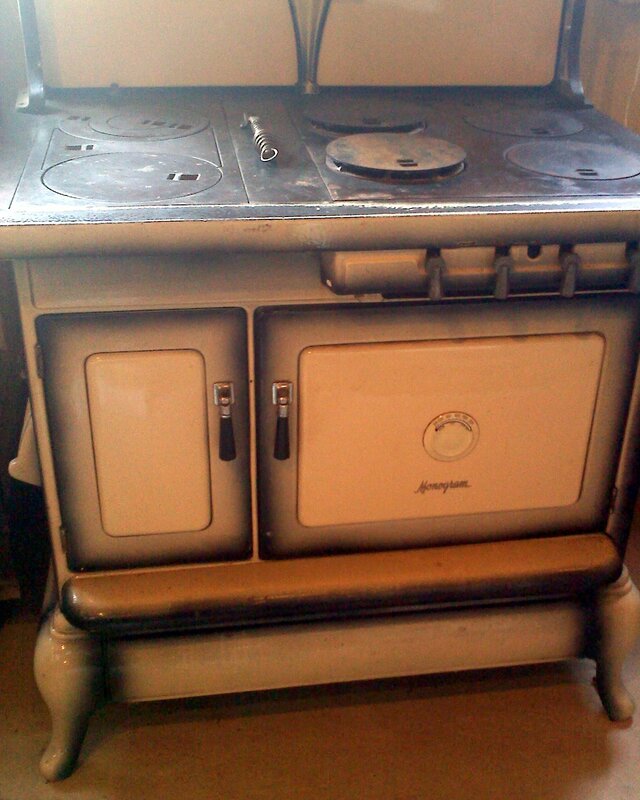 Have you cooked with an antique stove? 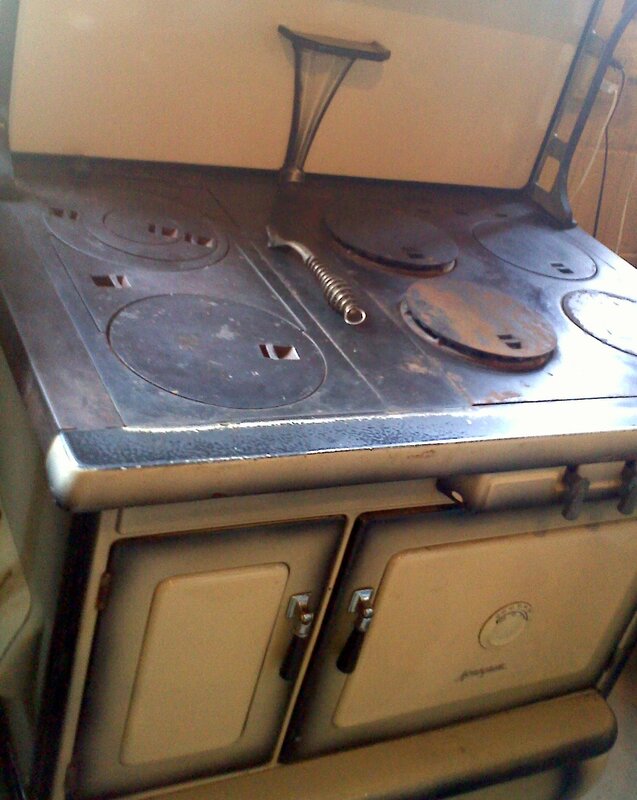 Any tips for regulating the temperature in this old oven? I promise to be back soon with some actual food!